Eleanor Wyatt died on December 13, 2018 in her apartment at Vista Del Monte surrounded by her family and friends. She is survived by her daughter and son, Catherine and Cory Wyatt; her younger brother, Henry Churchill Coles II; her grandchildren: Herbie, Brian, Morgan and Melissa, and great grandchildren: Ethan, Hayden, Dean, Alder, Lexi, Talia and Lucy. Elly (as Eleanor was known by her friends and family) was born to Henry Churchill Coles and Esther Victoria Swanson Coles on March 5, 1924 in Woodland, California and moved to Santa Barbara with her family when she was 8 years old. During WWII when her father’s army reserve unit was called into active duty, Elly was enrolled at an Episcopal boarding school, Saint Helen’s Hall in Portland, Oregon. Elly graduated from high school in 1942 and then studied at Stanford University. She was married for a brief time (1947-1951) and had two children (Catherine and Cory). Elly was always “ahead of her time”. As a single mother, she began her career in administrative health care in the early 50’s working as the bookkeeper for Hillside House. Later, she served as Executive Director of The Mental Health Association, and Phoenix of Santa Barbara, Inc., as well as similar positions with associated organizations for a number of years. 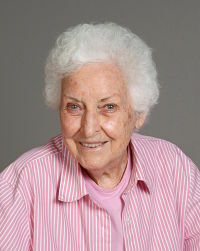 She completed her healthcare career as Director of Wood Glen Hall and retired in the early 1990’s. Elly was a life-long Episcopalian. She was a member of Saint Michael’s University Church in Isla Vista and Trinity Episcopal Church in Santa Barbara. At Trinity she was a Vestry Member for many years, as well as serving in the voluntary position of bookkeeper for the church. Both within the church and within the county political realm, Elly was seen as a person to be greatly admired and a person worth listening to. In her later years she continued to hold and express a progressive, and at the same time, a thoughtful point of view. She served as a mentor to many and always reached out to help where ever needed. She did indeed live her faith. In the early 60’s Elly became active in the Republican Party by joining local GOP clubs. She was a founding member of G.A.L.S. Club (a local unit club of Republican Women Federated). She was also an elected member of the Santa Barbara County Republican Central Committee where she served as Secretary for many years, in addition to being an elected member of California State Republican Central Committee. Along with all her other skills, Elly was a lifelong Bridge Player. And she was more than just “good”! Her friends at Vista Del Monte knew the end was near when Elly handed over all the records of the bridge club only weeks before she died. Elly was greatly admired and genuinely loved by many. A memorial service, followed by a reception in the Parish Hall, will be held for Eleanor Wyatt at Trinity Episcopal Church, 1500 State Street on Sunday, January 20th at 2:00 p.m. In her plans for this service, Elly requested that in lieu of flowers, donations be made to Wood Glen Hall (a nonprofit assisted living facility), or to a charity of your choice.